Four people killed in a Valisno bus accident in Quirino Highway - Balita Boss! @QCTrafficAlerts Accident along Quirino Highway, just before Dela Costa Village. Valisno Bus. 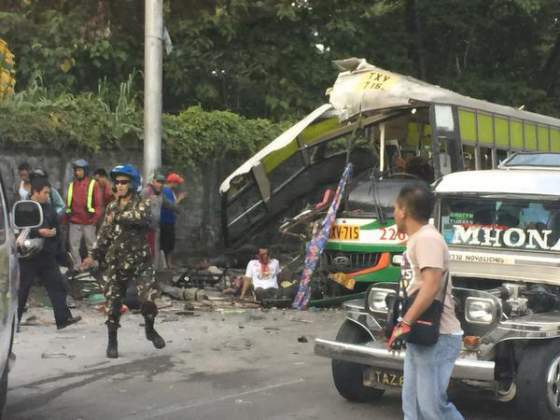 Four people were confirmed dead and 16 others were injured when Valisno bus, with plate number TXV 715, crashed at the boundary marker of Quezon City and Caloocan at Barangay Lagro, Quezon City. The bus was traveling towards San Jose Del Monte in Bulacan when the accident occurred around 7:20 in the morning, Wednesday (August 12). The QC DPOS explained that two passengers, a male and a female, who were retrieved from under the bus, died on the spot. The two other casualties were declared dead at the Dr. Jose N. Rodriguez Memorial Hospital in Tala, Caloocan, Dr. Amalia Villar, a resident doctor of the hospital, said. The man was already identified, but the woman, police said, was difficult to identify due to the serious damage on her face. But she is speculated to be between 30 to 40 years old, Insp. Marlon Meman, commander of the Quezon City Police District Traffic Sector 2, told CNN Philippines. Continue reading on CNNPhilippines.com. The board issued a 30-day suspension order against 62 units of the Valisno Express Bus, ordering the yellow plates of the buses confiscated. Aside from the suspension, the Board also requires all of the Valisno buses to undergo a road worthiness inspection by the Land Transportation Office. Continue reading on PhilStar.com. THE driver of the Valisno bus that killed four passengers was arrested on Wednesday afternoon, the Quezon City Police District (QCPD) said. The QCPD District Traffic Enforcement Unit Sector 2 said the bus driver identified as George Pacis was arrested by police in Balagtas, Bulacan at around 4 p.m. Continue reading on Inquirer.net. The Land Transportation Franchising and Regulatory Board (LTFRB) will be extending P150,000 financial assistance to the families of the four passengers who died in the Valisno bus accident. The 18 injured passengers will also get financial aid aside from the assistance that would be given by bus company. Continue reading on PhilStar.com.